Product prices and availability are accurate as of 2019-04-12 03:18:30 EDT and are subject to change. Any price and availability information displayed on http://www.amazon.com/ at the time of purchase will apply to the purchase of this product. 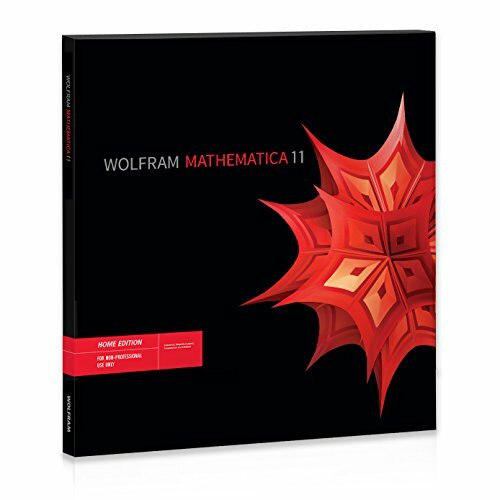 Mathematica Home Edition is the world's most powerful integrated computation system for hobbyists and enthusiasts alike, offering an affordable solution for personal use. Mathematica Home Edition is for nonprofessional, personal use. With the enhanced new features in Version 11, Mathematica Home Edition can now compute even more than ever before. Mathematica Home Edition is available in English, Chinese and Japanese, with support for other languages. This product ships as a physical DVD-ROM. Ultimate computation application for nonprofessional use by hobbyists, enthusiasts and others 500+ new features—adds 3D printing, audio processing, machine learning, neural networks Integration with the Wolfram Cloud, including free introductory use Flexible interactive documents to share data, reports, presentations, apps and more Coverage for data science, deep learning, image processing, engineering, finance, mathematics, etc.